The Texas tattoo scene is booming. It can be a bit over-whelming. Follow these guidelines to help you choose. There are essentially two scenarios for going about choosing a tattooer: one to avoid, and one to practice. Here we will take a look at both, first the most common mistakes, and secondly a sure path to success. Don’t let fate decide who tattoos you. If you aren’t already an established client, I’d advise against getting tattooed at a “walk-in” shop, where customers walk into the tattoo shop, looking to get tattooed, and will be assigned to whichever tattooer is “up”… meaning, whichever tattooers turn it is to work will be the one to serve you. This method of artist rotation is the businesses way of trying to share the available work equally among the employees, and prevent the senior artists from soaking up all the customer base which would result in the younger, less experienced tattooers going hungry, eroding overall shop morale. This scenario is an extremely risky way to get tattooed. * Lets say, for example, you want a tattoo that is the image of a rose, with your children’s names written in fancy script lettering along with it. Sounds simple enough right? Well suppose you walk into your local tattoo studio, step up to the counter and state your business, and there is a tattooer there who says “ok no problem, I can help you with that”. All set, right? WRONG… The artist you are speaking to may be a novice tattooer, they may not be particularly good at drawing roses or tattooing fancy script lettering. On top of all that they may not be especially friendly, clean, or have any inclination to really care about you, or wether or not you will happy with the tattoo they’re about to do on you. Everybody needs to eat, and it is very likely that they have bills to pay, need the money, and are simply working with you because it is their “turn” to take a walk in. There may be another tattooer in the shop at that very moment who is more experienced, can draw prettier roses, and specializes in fancy script lettering that you will never meet, or speak to- simply because it is not their “turn” to talk to walk-ins. The result will be an inferior tattoo, which could have been much more beautiful if you had taken a few simple steps, which I will cover in detail below. Walking into a street shop with a design and hiring whoever happens to be free at the moment is the most common reason for a collectors dissatisfaction with their tattoo. It is our recommendation that you avoid getting tattooed as a “walk-in” client whenever possible. It is, of course possible to have a great walk in experience. If you want a small tattoo, and are in a hurry to get it, a walk in shop is your best bet. If you must get tattooed as a walk in customer, research reputable tattoo studios, carefully inspect the prospective tattooers portfolio for consistent quality work that is not dissimilar from the sort of tattoo you are wanting, and don’t be intimidated into declining to work with anyone you do not feel is up to your standards. Research-research-research! Finding the right Texas tattoo artist takes time and effort! Currently one of the best ways to research tattooers in your area is online. Review boards such as YELP, and GOOGLE REVIEWS, can be quite helpful. Many people also find it useful to follow tattooers who’s work they admire on platforms such as INSTAGRAM and FACEBOOK. Exposing yourself to as many world class artists as possible will help to educate your eye for tattoo art, and help give you the discretionary tools to help you select and connect with a skilled artist. Another way is if you see someone with a stunning tattoo, ask who did the work. Yes, asking can be almost as awkward as being asked, but if it’s a serious inquiry, and they appreciate their artist they’ll usually tell you. There are so many differing styles and approaches to tattoo art, that everyone has the opportunity to work with an artist who is already very capable in the style, and with the subject matter you are looking for. Do not make the mistake of assuming that just because a tattooer is good at some things, that they will be capable of anything. 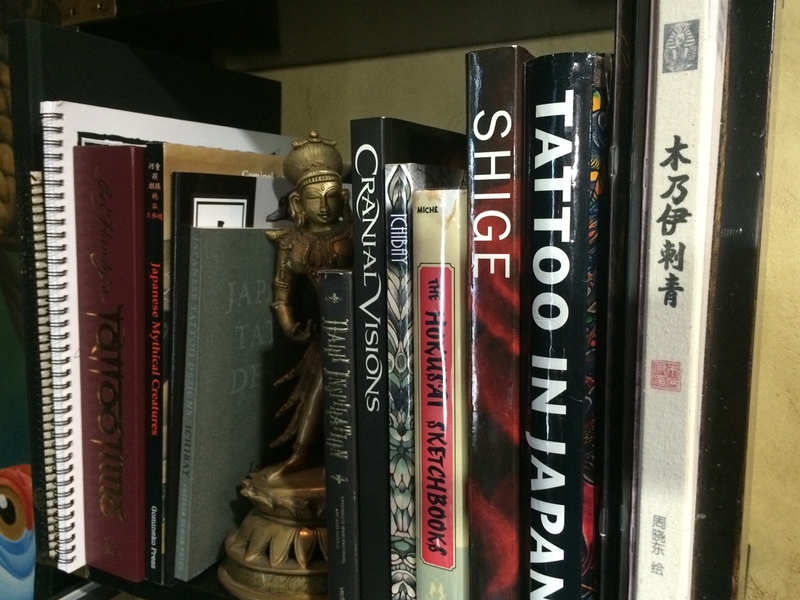 Many tattooers are highly specialized by the time they achieve a certain level of excellence, and are only fluent in a limited variety of tattoo types. Artists that are very versatile and also highly skilled in their abilities are quite rare, so it’s a good plan to go to an artist who already has work in their portfolio that is somewhat similar to the style you are looking for. Once you find an artist you feel you may be interested in working with, dig a bit deeper in researching them. If they have a website, READ IT. Their website can offer a tremendous insight into their work ethic, values, priorities, artistic sensibilities, disposition, and stability. I would also recommend a thorough scanning of their public profiles on Facebook, Google, Instagram, etc. Their online presence can also offer similar valuable insights. * Clean line-work. What does that mean? “Clean” is the word we use to describe lines in a tattoo that are smooth, solid, and easy to follow with the eye. Look for lines that have a consistent width. Even though it is common to “sculpt” the line-work in tattoos (which means the lines purposefully transition from thicker to thinner) it is done for specific reasons that enhance the tattoos readability. You do NOT want to see lines that appear broken, blotchy, clumsy, or difficult to understand. Also look at where lines intersect. Intersecting lines should connect fully but not overlap (in most cases). You do NOT want to see intersecting lines that should touch, but stop short of connecting, or seem to cross a bit too far over and poke out the other side. Lastly check the points. The areas in tattoos where two or more lines intersect into a point, such as the tip of a flame, should come together cleanly. You do NOT want to see points that come together too early resulting in a black line or a blob at the end of the point, crossed lines that make an “X” at the point, or missed lines that do not connect at all. * Solid color. What does solid color mean? “Solid” is the word we use to describe skin that has been fully saturated with color. Color should appear smooth, so that whatever fields of color are present appear unbroken, and rich. This applies to all tattoos, regardless of style or colors, as even use of washes and various shading techniques still demand that what is put into the skin is put in solidly. You do NOT want to see colors or shading which are patchy, irregular, cracked or marbled looking, or which do not fill neatly up to the line-work without spilling over the line-work. * Bright color. What does “bright color” mean? Possibly not what you might expect. If the colors in a tattoo appear bright, it isn’t because of the pigments the artist used, but the WAY they have used them. Most tattooers use basically the same tattoo pigments. They come out of the bottle the same for amateurs as for professionals. The way to make colors appear bright is by their proper use with complimentary and contrasting colors, and adequate use and placement of black ink. What you do NOT want to see are colors that appear muddy, flat, difficult to distinguish, or bland. * Pop. What does “pop” mean? If you look at a tattoo and you find it eye catching, it seems to have a lot of depth, bright contrasting colors and shades, and is easy to understand exactly what it is an illustration representing, then you are looking at a tattoo that “pops”. What you do NOT want to see are tattoos that you can’t easily tell what it is supposed to be a picture of. Tattoos that look dark, flat, boring, or messy. Overall, you should like your prospective artists work. Avoid getting tattooed by someone who only has one or two tattoos in their portfolio you liked. A capable, experienced artist should have a large, consistent body of work that you admire and enjoy. If your tattooers work is something that overall you really enjoy, you can relax, and trust that you will enjoy the tattoo they make for you. Meeting in advance with the person you are considering hiring to do your next tattoo is of VITAL importance. Every Texas tattoo artist is just a person, plain and simple, just like any other person you meet. The main difference is that your Texas tattoo artist is going to painfully apply permanent markings on your skin. This opens a slew of new concerns that can make or break your whole experience. There are too many tattooers available in any city to have anyone tattoo you who is not the best overall fit for your needs. Make contact with the artist you hope to work with, and arrange a visit. Here are some things to consider and watch out for. * Is the tattooer friendly, respectful, and easy/pleasant to talk with? * Does the tattooer LISTEN to you? * Does the tattooer make you feel rushed or intimidated? * Does the tattooer show you photos from their own portfolio? * Does the tattooer seem genuinely interested in and excited about your idea? When, and only when you are dealing with a tattooer who meets or exceeds all of the above criteria, and you get a feeling of excitement about working together with them to make a tattoo, have you found your Texas tattoo artist. michael has beed working in texas tattoo shops for nearly 15 years. The texas tattoo scene is booming, with so many talented texas tattoo artists to choose from, it is an honor to be able to work with the finest texas tattoo collectors.